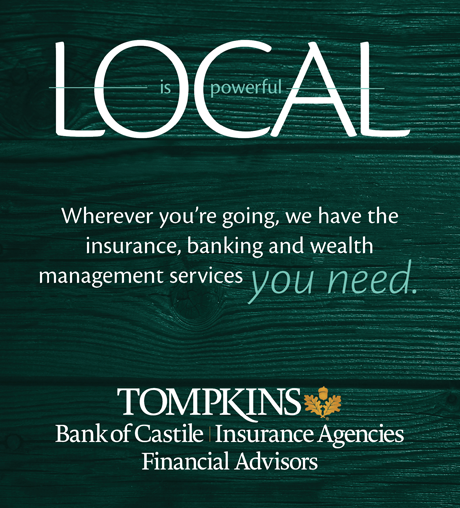 Pre-need funeral accounts in New York State are considered assets of the individual, not the funeral home. 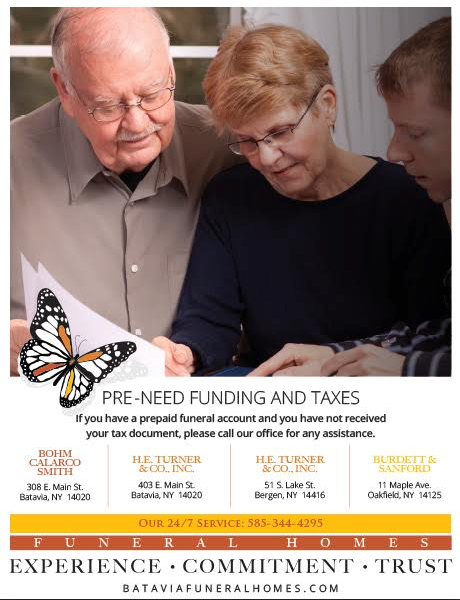 Each year, those that have prepaid their funerals with a funeral home receive a tax document for the interest earned in the previous year. If you have an account with any of our funeral homes, and did not receive your statement, please call us. We'd be happy to assist you. 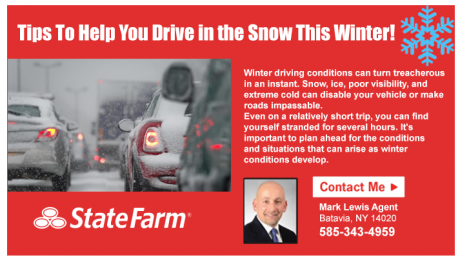 posted by Lisa Ace in Sponsored Post, advertisement, Mark Lewis, State Farm, Winter driving tips, winter, INSURANCE, batavia.. Inspect the exhaust system and the air, fuel, and emission filters. Check the cooling system, windshield wiper and antifreeze fluid levels, and change the oil. Make sure hoses and fan belts and all components are working properly. Consider changing the spark plugs. Check the tire pressure, tread life and consider installing winter tires. Locate the spare tire, jack, and ice scrapper. Inspect your wiper blades to make sure they're functional and in good condition. Never warm up your vehicle in a closed garage. This could lead to carbon monoxide problems. Keep your gas tank at least half full to prevent gas line freeze-up. Make sure your exhaust pipe is not clogged with mud or snow. Don't use cruise control on icy roads. Allow more time for braking when visibility is poor. Stay calm if you start to skid. Commercial vehicle drivers should exhibit caution when driving in winter conditions. If your vehicle is large, like a truck, it needs more time to stop in ideal conditions, so snow and icy conditions magnify the challenge. Take care to continue safe practices when sharing the road in winter conditions. Be prepared. While the best first step is prevention, some storms come on quickly. If you do get stranded, keeping a few essentials, noted above, in your car can help keep you comfortable while you wait. Stay inside. If possible, pull off the highway and turn your hazard lights on or tie something bright to your car’s antenna to signal that you need help. Then wait inside your car until help arrives to avoid exposure to frostbite and prevent hypothermia. Call 9-1-1. If you have a charged phone and reception, call for help and describe your location as best you can. Clear the tailpipe. Make sure there’s no snow covering your tailpipe in order to prevent carbon monoxide buildup inside the car. Check the tailpipe periodically to ensure that fresh snow isn’t blocking it, always watching for oncoming traffic before exiting your vehicle. Keep moving. Staying active inside your car will help you keep warm. Clap your hands and tap your toes to keep your circulation moving and prevent frostbite but avoid overexertion and sweating. Drink fluids. Dehydration can make you more susceptible to the effects of cold. If there’s no drinking water inside your car, melt some snow inside a bag or other makeshift cup to stay hydrated. Conserve your vehicle's battery. Use lights, heat, and radio sparingly. Run your engine. Provided you have enough gas in your tank, run the engine for about 10 minutes every hour to keep the car warm. Turn on interior lights when your engine is on so you can be seen inside your car. Open a downwind window slightly for ventilation and clear snow from the exhaust pipe to prevent carbon monoxide poisoning. Don’t overexert yourself. Cold weather puts your heart under added stress. If you’re not used to exercise, shoveling snow or pushing a car could put you at risk of a heart attack. 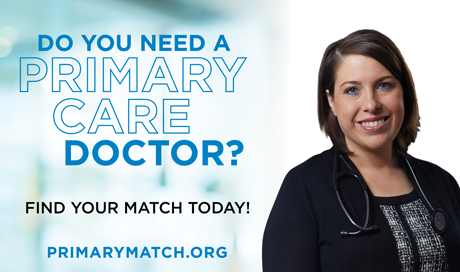 posted by Lisa Ace in Sponsored Post, advertisement, benefit, Rev. Erin Schubmehl Jacobson, Bethany. posted by Lisa Ace in Sponsored Post, advertisement, Oakfield, commercial, Industrial Real Estate, real estate, Reliant Real Estate, For Sale. Sweet Deal! New Listing Alert: 59 North Pearl Street Oakfield offers more than what meets the eye! This solid commercial building with a space for everyone! Attractive large office space that has large private conference room, main office space, and front office. posted by Lisa Ace in Sponsored Post, Genesee Symphony Orchestra, Music Brian, Brahms, Bernstein. posted by Lisa Ace in Sponsored Post, advertisement, Oliver's Candies, Valentine's Day gift, candy, chocolate, gifts, batavia..
131 Oak St., Batavia. Solid and spacious this ranch home has much more room than meets the eye at the road! Three bedrooms and full bath on main floor and one additional bedroom with full bath and bidet in the basement. Open and large living room with cozy gas fireplace and kitchen/dining room, great for entertaining. Downstairs has lots of room, great storage space and extra living /play area! Besides the attached garage, there is a great deep backyard with easy access to watching all the games! Easy to see! Call Lynn Bezon at Reliant Real Estate today 344-4663 or click for more details. posted by Lisa Ace in Sponsored Post, advertisement, Valle Jewelers, batavia, gifts, Valentine's Day, Love, jewelry. posted by Lisa Ace in Sponsored Post, advertisement, Oliver's Candies, Valentine's Day gift, candy, chocolate, gifts, batavia. posted by Lisa Ace in Sponsored Post, advertisement, notre dame high school, open house, education, ND, batavia. posted by Lisa Ace in Sponsored Post, advertisement, Reliant Real Estate, Summit St, real estate, homes for sale. Batavia. posted by Lisa Ace in Sponsored Post, advertisement, Open Houses, real estate, Pavilion. 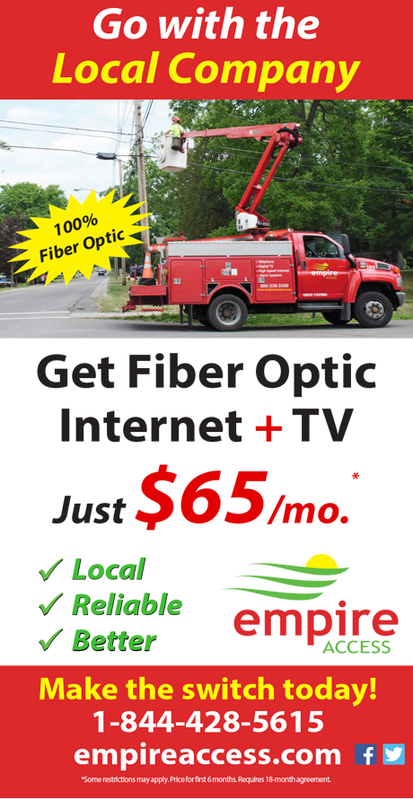 posted by Lisa Ace in Sponsored Post, advertisement, Reliant Real Estate, Lynn Bezon, Homes for Sale, genesee county..
131 Oak Street, Batavia. Solid and spacious this ranch home has much more room than meets the eye at the road! Three bedrooms and full bath on main floor and 1 additional bedroom with full bath and bidet in the basement. Open and large living room with cozy gas fireplace and kitchen/dining room, great for entertaining.